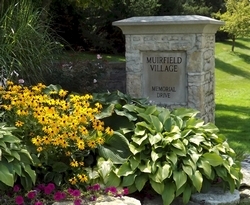 Community Life - Muirfield Association, Inc.
Muirfield Village is a planned community with beautiful homes on manicured lawns nestled within some 1,650 acres of wooded areas with scenic vistas, open spaces, and rustic natural landscapes. Our community accommodates a mixture of lifestyles including busy families with children, empty nesters, singles, and active senior citizens. All residents enjoy a beautiful country setting while being conveniently near a suburban environment. The Village has nearly 2,400 lots that contain condominiums, patio homes, and single-family detached homes. There are many neighborhoods or courts with their own settings and personalities in our community, every one created after a detailed study of the unique natural qualities of each section of land. Muirfield Village has four primary environments: golf course neighborhoods, wooded neighborhoods, ravine neighborhoods, and open land neighborhoods. Several of the neighborhoods manage their own sub-associations, with the Muirfield Association as the decisive governing body. An extensive walking and biking path system, unlike any other central Ohio community, connects each neighborhood. A limited number of collector streets, branching off into quiet cul-de-sacs or courts, give the neighborhoods a pleasant "coming home" feeling. The Association maintains adequate reserves for capital improvements. At no time in the history of Muirfield Village has an additional assessment had to be made for unexpected or extraordinary capital expenses or improvements. The Board of Trustees is committed to a secure, conservative operating budget. At this time, the annual assessment is $2.20 per thousand dollars of the fair market value of the property. All amenities that the Association offers meet local, state, and federal standards. Muirfield Village is a Planned Unit Development (P.U.D.) community established for the control of property standards. The Association operates and maintains two recreational facilities. The Glick Road facility features a pool with a diving bay, nine lap lanes, swim area, water slide and a baby pool. It also has a playground, basketball court, sand volleyball court, and six lighted tennis courts with a tennis pavilion. A full tennis program with organized tennis activities and an exciting learn-to-swim program throughout the summer months are typical of the activities located at the Glick Road facility. The Holbrook Recreation Complex on Muirfield Drive has a pool with a diving bay, six lap lanes, zero entry swim area, baby pool, stainless steel hot tub and separate sprayground. The facility also features four lighted tennis courts, a playground, and a basketball court. The Association maintains over 250 acres of common ground with trees, shrubs, flowers, open vistas, and natural wooded areas and 29 miles of paved pathways for residents' pleasure in walking, jogging, or biking. In addition, the Association owns twelve lakes fully stocked with crappie, catfish, and large-mouth bass. Residents are welcome to fish in these lakes and are not required to hold an Ohio fishing license. The Association employs a full-time maintenance department to establish and preserve the existing amenities with timely maintenance and repair. This department also manages turf maintenance and landscape standards. We employ a full-time administrative staff whose business hours are Monday through Friday, 8:00 am to 4:30 pm. They are always happy to assist you with any concerns or questions you may have. The office phone number is 614-889-0922. We hope presenting these facts about Muirfield Village will provide you information to make a valued judgment of our community.